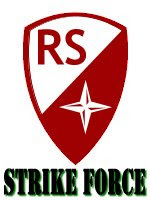 Operation Yellow Elephant: I think they meant "Strike Out"
The conservative website, Red State, has designed a insignia for their supporters if they are interested in "being a part of the Army of Redstate Activists"
OYE Comment: As Whiskey Fire alluded to it could be a lot like the Kiss Army without guitars, groupies, fans, and the patch isn't as cool either. If they're in the same 'shape' as the other yellow elephants, they can definitely kiss any groupies good-bye! On a related note, I see that Joe The Wanna-Be Plumber is going to Israel to 'report' on the war there. Anybody know if that clown served?